Yes, she is my sister. My sister, Este, and I were tested as kids to see if either of us had Polycystic Kidney Disease (PKD), a genetic disease. Our other sister, Robin, and our mother died because of complications with PKD. I always knew that because Este had it and I didn’t, that I would donate my kidney to her if we turned out to be a match (as siblings there’s actually only a 20 percent chance of being a match). It was not a tough decision because I knew she’d do the same for me. I didn’t have a lot of concerns because I know that hospitals do this so routinely now. I was a little nervous about waking up in excruciating pain after the surgery—I imagined something like this would be painful. Honestly though, whatever I was concerned about couldn’t possibly be as bad as the thought of my sister having to go on dialysis or dying of kidney failure. My family knew for years that this was a possibility. I told my children that this is a family event and we will all help to make it a success. They would help with meal planning and transportation to and from their activities. They felt proud that their mom was doing a life-saving thing for their Aunt Este. My friends were surprised, told me that I was very brave and that they admired me for it. Some said they don’t think they could do it, that they’d be too scared, others said they’d do the same for their sister or brother. Many of them said, “I hear it’s harder for the donor!” Everyone was very supportive before and after the surgery. It was actually a little overwhelming in a good way at how many people reached out with kind messages. 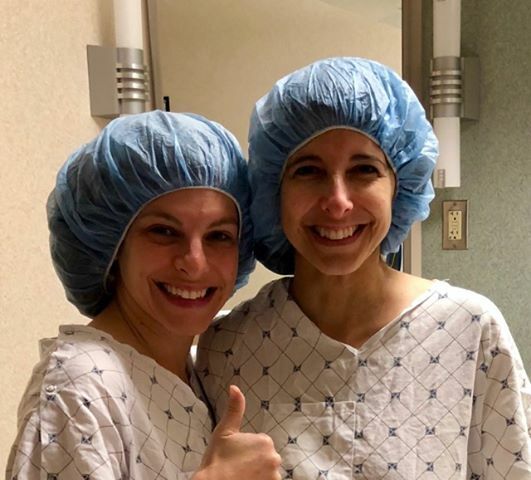 Emily (left) and Este before surgery. The surgery went just as expected, only a much easier recovery that I had thought. They moved quickly once we got to the hospital. The IV was administered, I gave my family hugs, and the next thing I knew, I woke up in recovery. The surgery lasted about three hours. My recovery was very smooth. I had expected to be in a lot of pain from the incision and stitches. People warned me that I might feel gas from the air they use in surgery. Fortunately, I didn’t feel any gas pains (though I did have a few burps!). The nurses really managed the pain levels, so that was much easier than expected. I was worried about constipation from the narcotics, but that was proactively addressed also. I didn’t have a big appetite following the surgery so I would just take a few bites of the food at the hospital. The surgery was on a Monday morning, and I went home on Wednesday night. My appetite came back by Wednesday, although I’ve never been a big eater anyway. I was never nauseous or felt sick. They had also given me a nerve block during surgery that lasted until the second day, so the surgery area did not give me much pain at all. It wasn’t too difficult for me to move in the bed, and I even got out of bed on the second night to walk down the hall and visit my sister in her hospital room! My stepmother stayed at my house and was a huge help, especially with meals, clean-up and getting my kids to their activities. We also watched a lot of Netflix together! I slept a lot the first week. I was still taking the pain medicine, around one pill every six hours so that made me sleepy. It was freezing outside so I’d walk laps around the house to keep moving. This helped the recovery too! There was a little discomfort when I walked in the beginning but certainly felt much better by week three. At week six I felt back to normal. I never felt pain while just sitting or sleeping. I weaned myself easily off of the narcotics and took the occasional Tylenol if needed. I take a pretty intense cardio workout dance class and was unable to participate in that for six weeks. I missed being able to do that, but it’s certainly not a big deal considering the outcome of saving someone’s life! Emily (right) and Este after surgery. I didn’t schedule any painting on canvas parties during the six weeks of recovery because I wasn’t allowed to lift more than 10 pounds. Otherwise, I was fine to do light housework and drive my kids around town after about three weeks. They knew after one week at the University of Cincinnati that my blood work and other tests were a perfect match. Then I went back a couple of times for some more testing to make sure I was healthy both physically and mentally. The hospital wants to have successful surgery outcomes just as much as we do so they do everything thoroughly—from explaining what to expect to testing everything, and answering our questions so that we feel ready and confident. I was shocked at the number of people who reached out and thanked me for saving my sister’s life—maybe they were friends or relatives with her, or maybe they didn’t even know her but loved our story. It’s very heartwarming to see acts of love and happy endings in today’s chaotic world. It made people stop and think about what a miracle this really is, that we live in a time of good technology and medicine and can do this. The support made me feel so good, that at times, I even got emotional. It was also good for my children to see this. Friends and family really came together to help us heal from the surgery. They sent oodles of cards, candy, and flowers, said prayers, and just were so positive because of how much this made them feel the love. This love transcended throughout my home, my family, and will be something I will always remember. Yes, in a heartbeat! I believe we are given a spare kidney for a reason. My experience was really not difficult at all, and SOOOO worth it in the end to save someone’s life.